Want to play games on your 3DS? That's so old-fashioned! 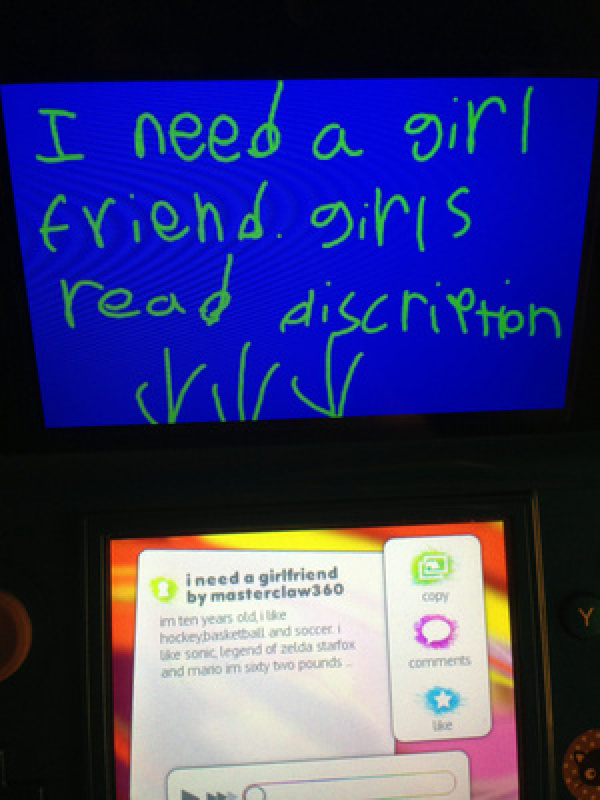 Why not use it to find a boyfriend, or according to a ten year-old boy, a girlfriend. That's right, young "Masterclaw 360" posted up on the Colors! 3D 'I need a girlfriend. Girls read description', with arrows pointing down towards the description box on the touch screen. Funnily enough, someone actually responded to the post, but sadly the picture has since been removed from the Colors! online gallery, therefore the response is gone, too. Valentine's Day is just on the horizon, time to load up the creative app and start posting similar pictures if you want some multiplayer action on this commercially loved-up day. I was going to do a CNY painting in Colors3D, but I cbb'd. 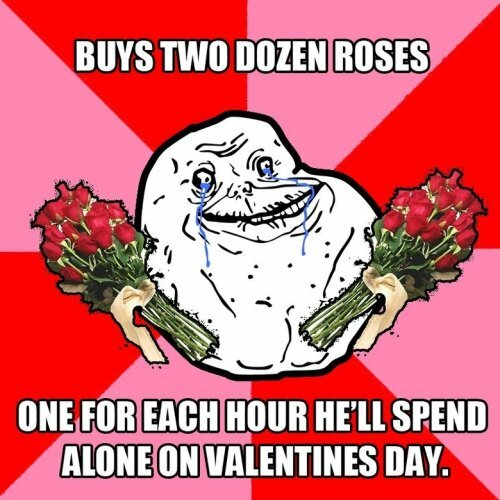 I imagine the same thing will happen for Valentines' Day. It's just ten o' clock, in Italy at least. You can't be forever alone when you're 10 years old. I'm sure he'll find a girlfriend in a few years. Whether it's a slow news day or not, it's seriously weird to report on something like this! Aww he can't spell description. Can this be used to find a bromance ? Guys, it's not a slow news day (this was posted at 9am UK time/early hours US), we just like posting stuff around Nintendo culture as well. Life doesn't always have to be so darn serious! I have this game, this is always on there, like a few every time I load it up. -.- They always get responses, although usually its girls looking for guys. Gamers need love too. My wife has gotten through 4 Zelda's, Tales of Symphonia, Arc Rise Fantasia, and is working on The Last Story. I wonder why they removed the post. Things got hot? People do this all the time on colors (watch out for pedo bear). It probably got removed because it wasn't artsy. Kid's parents need to be talking to their son right about now. This is why I abandoned Colors! 's gallery. Haha That pretty funny. If only it were that simple kid. The kid in question wouldn't be so keen on a girlfriend when she's fleecing him out of all of his money. Isn't that the age where you still are saying "eww!!" to girls? I don't bother with artwork that has mainly words on it. That goes for all those comic strips that people keep putting up. This is one of the reasons why the Colors!3D community is annoying. It's still a pretty handy app though. Yeah, I seen even worse things on Colors! there's people with drawings asking you for online.............well, I think you know. Whether you consider this as news or not, it's definitely an interesting post that I didn't mind reading! The Colors 3D community is pretty much Hatena all over again. That isn't entirely negative, though, because Hatena still had a lot of awesome people who just wanted to post something cool or funny. Same case with Colors 3D, there are still a lot of neat people on there, you just have to dig for them. It's too bad that they don't have an indepth profile system, commenting interface, and search/page function. It can get a lot better, but it's still very handy. i once met someone on drawsomething. we were randomly paired up and eventually started talking. after a few months of texting and messaging and talking we met in person and we dated for just under a year till they moved to deadhorse alaska... yep. that happened. i even did a piece on colors about it. haha. Colors 3D is how I met your mother. Aw man, please don't give this kid attention. It's cute and everything, but soon the idea will catch on and Miiverse will be filled with people trying to hook up. Kind of like how one person told everyone how many "yeah"s he/she had, and suddenly everyone had to do it. A bit strange to consider this news. As one who has spent a fair amount of time browsing Flipnote Studio and Colors 3D, these types of posts are incredibly common. Don't see why this one is any different. 30/m/Oregon. Dude thats hot. Lets meet up at the Golden Corral. looks like the 3ds isnt the only way to meet someone! Thanks colors and Nintendolife for hooking up two more hotties. Love does exist people. What I want to know is will it help me land one of (or all of ) my Big Three: Rachel McAdams, Emma Stone, and Anne Hathaway (yeah, she's married... doesn't bother me )? If so, count me in. Otherwise: "Valentine's Day? BAH, HUMBUG!" is this even news? i've seen this more than a million times, and it's showing up now? i know it's almost Valentine's Day, but doesn't this technically count as bullying the Original Poster? This is not news,who cares about a chubby 10 year old looking for a girlfriend. Meh. I could try doing that, but I'd still be forever alone. Don't give up Unseating. Look what happened to me! Uhhh.....I dont see how this is considered as news. Weird stuff. People do stuff like this in youtube comments, I know everyone needs love, but it gets annoying and being desperate is not attractive. Can,t believe someone has replied!